This auction will be held online only. The farms are located in Monona County in different locations. For directions to the farms contact the Farm Manager. To bid, click the green button at the top right of this page. 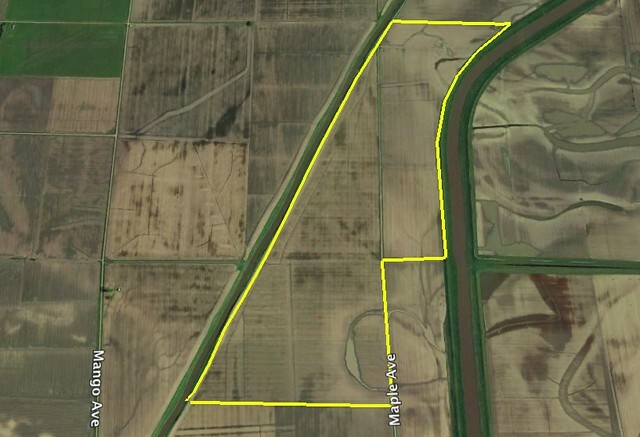 Robert Glace will offer his 1689.43 Acres of farmland in Monona County Iowa for lease for a 3 year period in 4 tracts. The terms of the lease shall remain the same from year to year with the exception of cash rent which will be negotiable each year based on current commodity markets and agreement of the tenant and landlord. The rate of rent sent by this auction will be effective for 2017 only. Landlord is open to re-negotiating rents for 2018 and 2019 rents. All other terms of the lease will remain the same for future years. 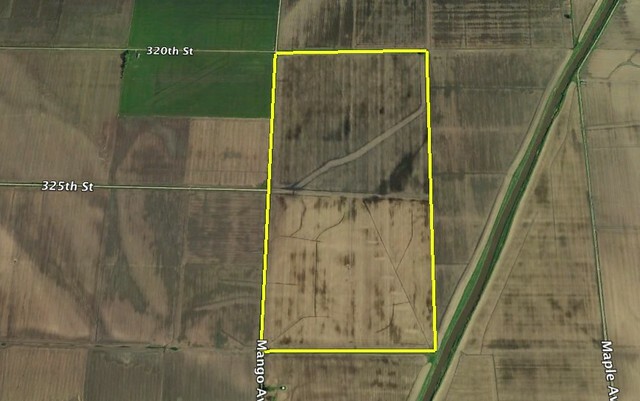 Tenant to provide the results of soil samples in year 2 of the lease for the landlord. Tenant will be agreeable to soil amendments based on results of soil samples and cooperate with the landlord to determine appropriate amendments and fertility requirements for the farms. Tenant will be responsible for all weed control on the farms. If grain bins exist on a farm leased the operator may use the bins with no additional charge and shall be responsible for all repairs necessary to use the bins. 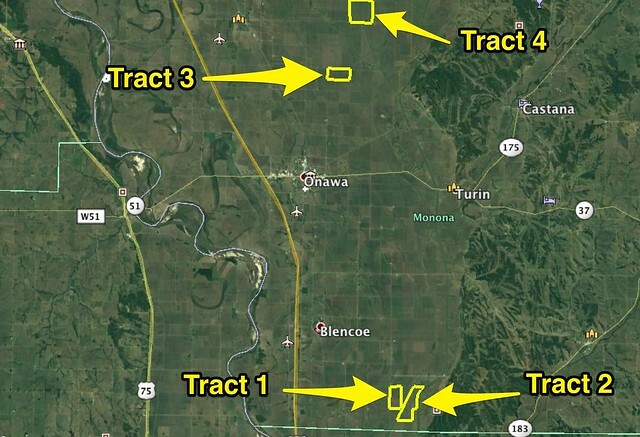 Where water wells are present on the farm the tenant may use the water wells and shall be responsible for any repairs or maintenance costs associated with the wells during the term of the lease. Any irrigation pivots on the farms today are not owned by the landlord and are not a part of this lease. The tenant will not be responsbile for moving the pivots. Tenant shall be responsible for insuring their equipment and operation against liability and casualty events. No hunting will be allowed on the farms without written permission from the landlord. Tenant will be prohibited from using the farms for any livestock holding or grazing. In 2017 rents will be due on March 10th and in subsequent years rent will be due on March 1 of each year. Bob is offering his farms for lease via online auction. There will not be any live event for this auction, it will happen online only and will end on March 2nd, 2017 at 3PM. Bob enjoys owning farmland and has owned farmland all of his entire adult life as an investment. He enjoys visiting about the land and takes interest in your farming methods. You will find him to be the type of landlord that you enjoy renting from. His desire is to establish a long term relationship with his tenants and this is the reason he is offering a 3 year lease, he understands that the promise of a long term relationship means you will treat his farms the way he desires for them to be taken care of. He does not want to have to change tenants frequently so bid with confidence that you won't have to hassle on a yearly basis to know if you'll have the ground. 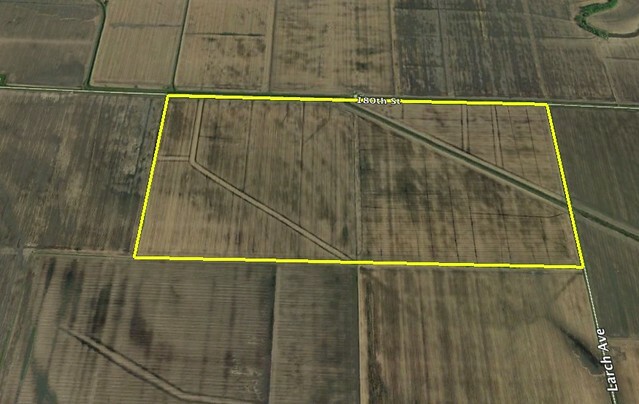 This auction will be based on a multiplier of acres in the Auction Details clause. All bids will be multiplied by the appropriate multiplier. This is an online only auction, there will not be a live event. All bids should be placed on our website. You can also download the DreamDirt Auction app on your smartphone or tablet and place bids using the App. While Bob has no intention of doing such he does reserve the right to cancel this auction at anytime for any reason including the acceptance of an acceptable offer of rent prior to the end of the auction. If you are the successful bidder you will receive possession of the farms upon the payment of applicable rents. You will sign a written lease agreement with the landlord on or before March 10th. No earnest money will be due. Rent will be collected on or before March 10, 2017. 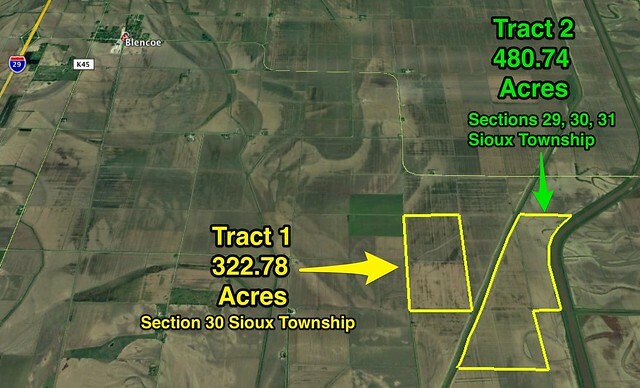 This tract is located southeast of Blencoe Iowa in Sioux Township. From Onawa go south on K-45 to Blencoe, then east on E60 to Maple Ave. The farm is near the Harrison County line. This is an auction for rental lease price. This property is NOT for sale. There are 2 irrigation wells on this property. Located south and east of Blencoe Iowa in Sioux Township. This is an auction to set rental rate for this farm for 2017 crop year. This farm is not for sale. 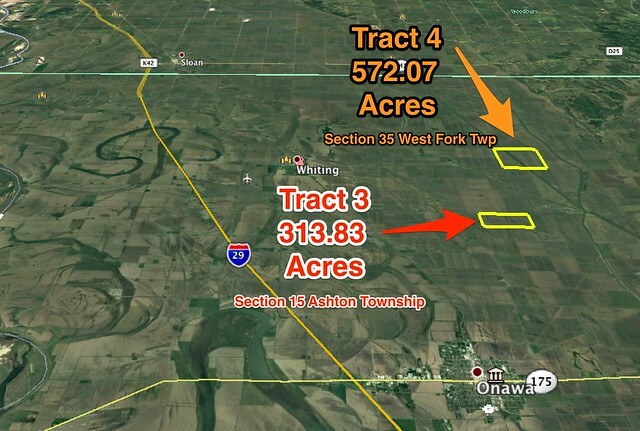 This tract is located northeast of Onawa Iowa in Ashton Township. This farm is not for sale, this is a lease auction to set the land lease rental rate for 2017. 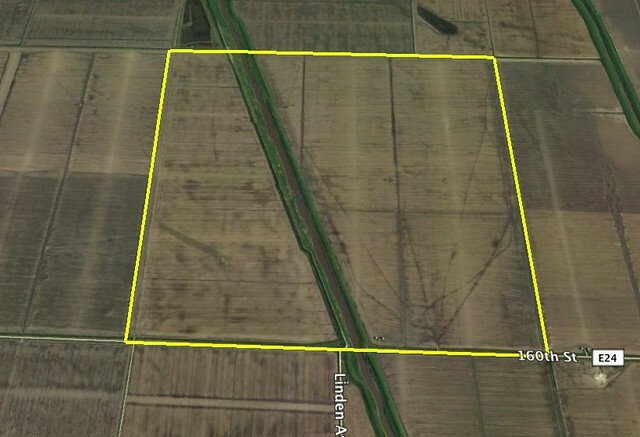 This farmland is for rent and the rental rate for 2017 will be set for this auction.